An attempt has been made here to bring together an important part of the traditional daily food prepared in the Marash kitchen, including special dishes that are traditionally prepared on festival days. Alongside recipes, extra information has been provided, as far as possible, to do with the dishes, customs and traditions. The diversity and individuality of Marash cuisine demonstrates the Marash Armenian woman’s mastery of culinary skills as well as the general fondness for food. The traditional Marash Armenian kitchen is rich with delicious dishes. An important place in Marash cuisine is held by meat dishes; naturally the plentiful supply and use of meat is determined by not only the natural Marash environment, but also by the life of the Marash people and their way of living. The people of Marash generally use male goat’s meat, lamb and mutton, with beef or calf being used more for preparation of salted and spiced cuts and sausage. Animals are slaughtered every day, and only fresh meat is sold. The region’s fertile fields produce every kind of cereal and vegetables – wheat, barley, millet, rye, lentils, sesame, chickpeas, beans, peas, broad beans and especially rice. Marash cuisine is thus filled with various vegetables. The Marash Armenian table that is prepared for ordinary and feast days is always replete with different pilav dishes made with oil and prepared with cracked wheat (bulghur), de-husked wheat (dzedzadz) or rice. The many kinds of pilav dishes prepared in the Marash Armenian kitchen bear witness to the housewife’s creative ingenuity. It is characteristic that in Marash dialect pilav is called abur, instead of pilaf which is used in many Armenian areas, while different kinds of soup are known as shovro. 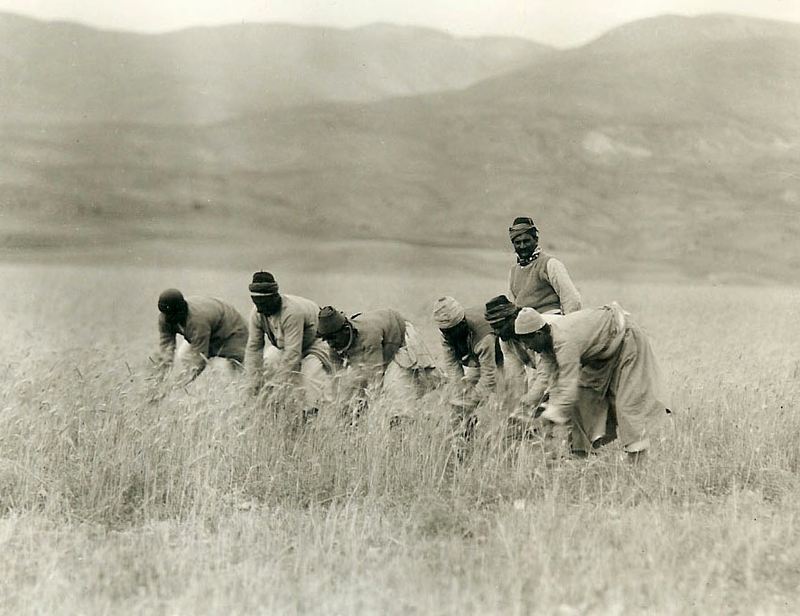 Generally speaking, the use of rice among Marash Armenians is more common, because rice cultivation is widely practiced in Marash and, as a local harvest, is not only plentiful but also readily available. The forests that cover the surrounding mountains, while investing them with natural beauty, also secure every kind of harvest and foodstuffs, whose availability adds to the Marash Armenian cuisine, making it even richer and more appetising. Syrup has a permanent place in Marash Armenian cuisine, and sweets prepared from it are ornaments for the festive table. Concentrated sesame paste (tahini or shirig) is also widely used as is sesame oil (shirlaghan yaghe). The latter is used especially during the weeks of Lent. Sesame paste was originally prepared in the home, and more recently has been produced by factories called mahsere. There are many different kinds of bread in the Marash kitchen. 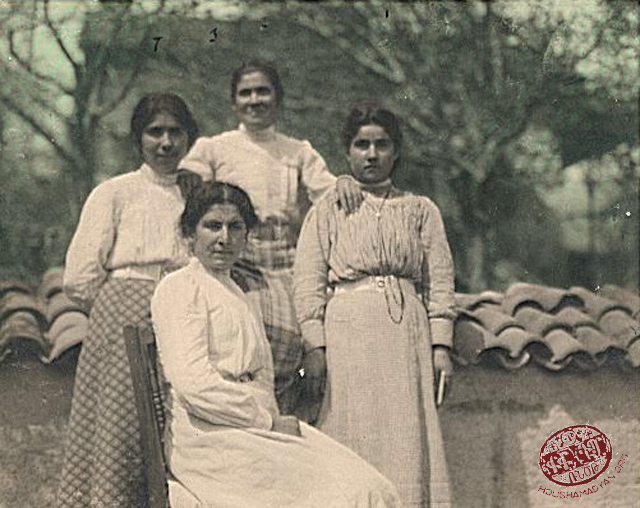 The bakers of Marash – the ekmekdjis – are generally Armenians; they produce various kinds of circular loaves, ring breads, baksimats, cakes, as well as a kind of pastry called boghacha. Chick-pea yeast – nohut mayasi or tatli maya - is used as yeast in making bread. Apart from the bread prepared and baked in the bakeries, it is the custom to bake bread at home. This kind is very thin, made without flour and a form of lavash (paper-thin unleavened bread), baked on a sadj (a dome-shaped metal vessel) placed over the heat. Enough for several weeks is made at any one time and is kept in the larder in drum-shaped wooden casks called hatsamon (breadbin). Particular kinds of bread are preferred for certain dishes, with lavash – barog hots – having a special place on the table on Sundays and feast days. 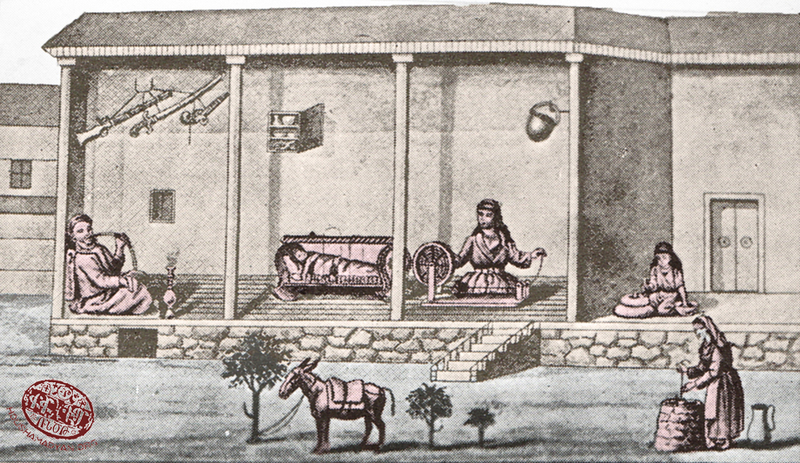 Generally Marash, with its plentiful cereals, legumes, meat as well as chickens, milk, fruit and vegetables is a self-sustaining town, with foodstuffs being cheap and of excellent quality. Among Armenians of Marash too, almost all the festivals have their special dishes. On festival days, Holy Christmas and Easter Eve, alongside various dishes, the basic cuisine is made up of various kinds of pilav and patties prepared with meat – boiled, fried or roasted. At Easter a lamb is always slaughtered to have the meat for the preparation of various dishes; sometimes it is filled with previously prepared rice pilav with plenty of almonds and pistachios, and cooked over a low heat or in an oven. Syrup soup (roupov shovro) is always prepared on New Year’s Eve; on St Sarkis gruel (pokhint) and saltless bread (alla hots); at Paregentan cooked, de-husked wheat (heriso – herisa); during Bread-and-Salt Week and the middle of Lent hadag shovron (grain soup); at Easter coloured eggs; and so on. It is also through these dishes that the meanings of traditional Armenian festivals are emphasised and, bequeathed from one generation to the next, have persisted among the Armenians of Marash. Severe fasting is also special to the Armenians of Marash; during days of fasting practically the whole Armenian population observes the fast, when all foods made from animal products are forbidden, being replaced by dishes made with olive oil and vegetables. The people of Marash, being unused to breakfast, eat tarkhana (dried curds mixed with pounded wheat and yoghurt) soup, lentil yogurt, syrup soup or wild pistachio (melengish/menengiç) soup instead. Specific main and evening meals are pilavs made from rice, cracked wheat (bulghur) or de-husked wheat (dzedzadz), different kinds of vegetables cooked with meat, different kinds of stuffed vegetables (dolma) etc. 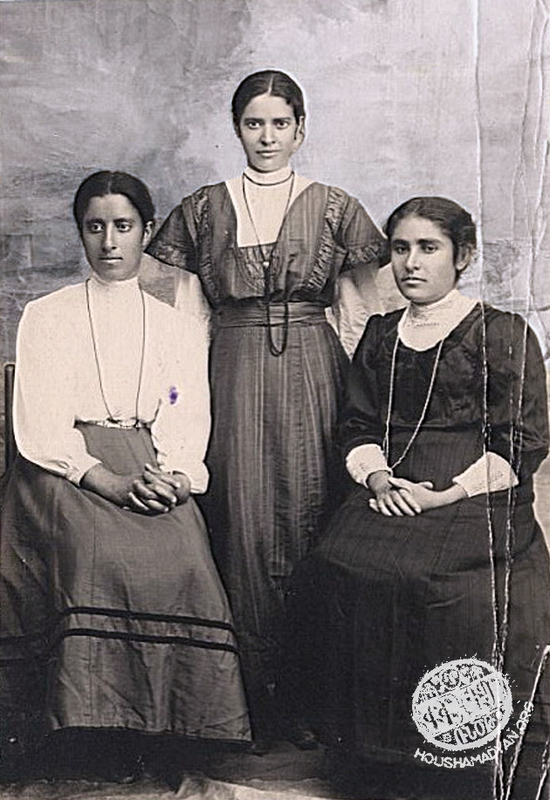 Naturally, Rev Djenanian wrote this description referring back to the days of his youth – to the way the Marash Armenians lived in the mid-1800s - but we know that later, at the end of the 19th century and the beginning of the 20th, the Marash Armenians way of living had changed and European customs had entered Armenian homes. As in each town, the Marash Armenian also has unique kinds of food, but the most famous and unique dish is marrow and de-husked wheat pilav (keshgeg tabakhli). Marash is distant from the seashore and there are few fish in the nearby rivers, so fish is not eaten much. Fish is brought to Marash from nearby lakes only at certain times of the year and sold in the market. The Marash Armenian cuisine has relatively few dishes made with flour, unlike certain other Armenian-inhabited regions, where dishes such as dried flour, water and salt dough cut into long thin strips (erishda) and dough packets filled with meat (manti) etc are prepared. 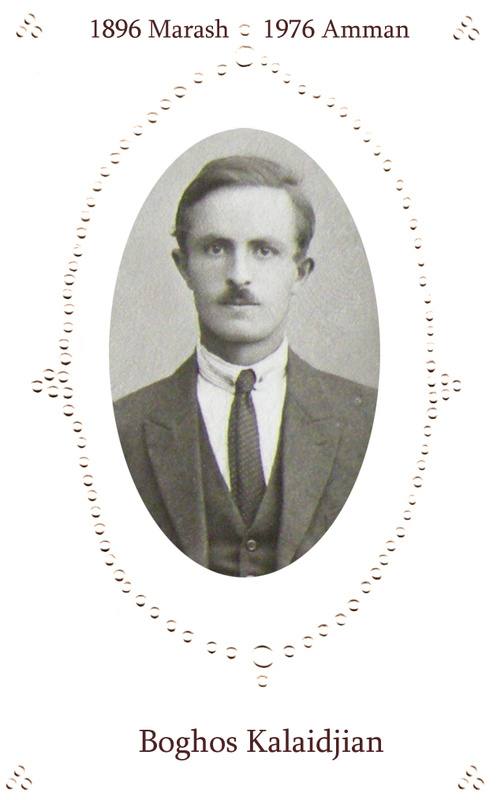 Naturally, the Marash Armenian menu has also been subject to various influences over time, has changed and been enriched with new elements, but it is obvious that the dishes relating to the various feast days have remained virtually unchanged and have a very close similarity to traditional Armenian cuisine. 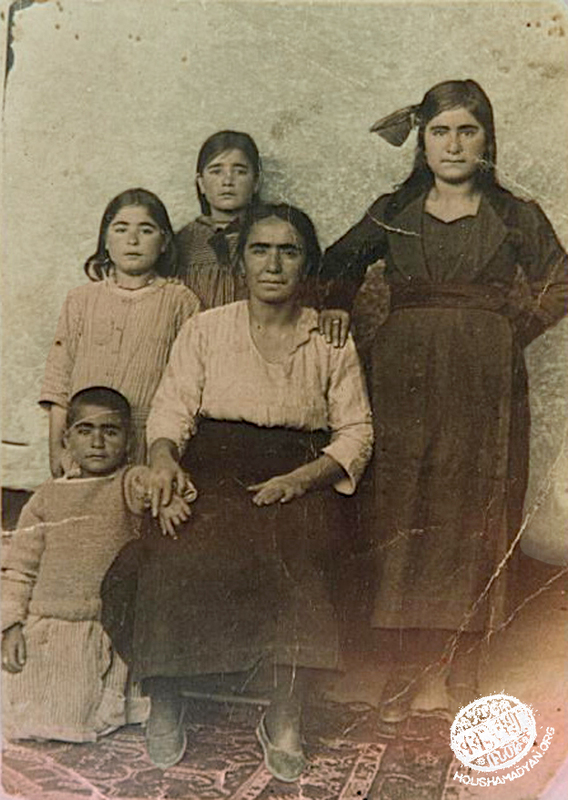 Generally, traditional family customs, as well as cuisine, although differing from one another in Cilicia and other Armenian regions, have similarities and a certain generality. 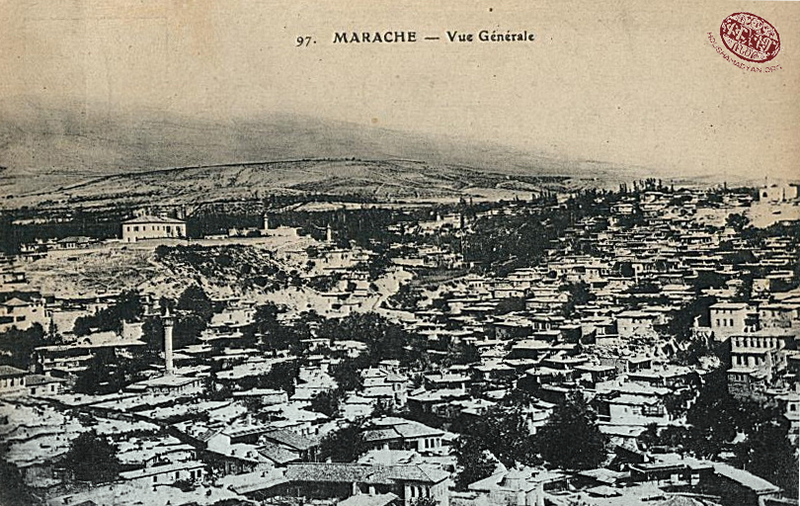 In the specific case of Cilicia, it is well known that its cuisine has been influenced by many others, but traditional Armenian dishes prepared in Marash and nearby towns are generally similar. Without doubt the taste and smell of all the dishes in the Marash Armenian menu have been imbued with the warm atmosphere of the traditional Marash Armenian home. 1. Mix the flour, olive oil, yeast, salt, tepid water, egg and sesame oil and knead well into dough. Cover with a cloth and leave it to rest. 1. Heat the olive oil in a large frying pan, add the onions and stir until they soften. Add the garlic, then the Swiss chard, spices, tomato and pepper pastes. 2. Turn off the heat and leave to cool, then add the sesame paste that has been slightly thinned with water. 3. Divide the dough into two halves, roll one half out to the size of a tray using a rolling pin, and place it in the bottom of a flat baking tray. Put the filling evenly on it, leaving the edges clear. 4. Roll the other half out to the same size and use it as the top, sealing the whole by pressing the edges of the top and bottom together. 5. Beat the egg and coat the top surface with it, also adding a coating of sesame oil, and put it into the oven to bake evenly, until it turns pink. 6. Remove from the oven, cut into square pieces and serve either hot or cold as an appetiser. Note: The ornament of any fast day table. Cakes using Swiss chard are prepared everywhere, but the kind enriched with sesame oil added is usually only made in Marash. 1. Wash and drain the cracked wheat and put it on a large dish or on a tray. 2. Add the salt, cumin, diced tomatoes, all the onions and the parsley. Mix thoroughly then put to one side. 3. Thin the sesame paste with the lemon juice and spread it over the mixture, and mix once more. Spread the whole evenly and thinly over the bottom of the dish and serve. Note: This delicious and satisfying dish made with uncooked cracked wheat is more usually prepared by the people of Kilis and is called by that town’s name: Kilis ichi (Kilis içi). In Marash this dish is prepared with sesame oil without tomatoes or pepper. Thanks to the plentiful supply of sesame oil in Marash, a new version of it has been created. 1. Wash and drain the cracked wheat. 2. Heat the oil in a large saucepan, add the chopped onion, and fry until the onion softens. 3. Add the cracked wheat and mix thoroughly. Add enough water to cover the saucepan contents. Add the salt. Cook over a low heat until the water is absorbed. 4. Serve the pilav hot on a large dish, having slightly thinned the yogurt with a little water, and spread it over it. This dish is prepared with the dried centres that were retained from hollowing out and drying aubergines and the green parts of the skins. In other words the centres of the aubergines that have been hollowed out and dried for the winter to prepare dolma and the green part of the skin have also been dried and used in the preparation of this separate dish. 1. Boil the dried centres and green peel of the aubergines in water. After boiling discard the water and allow them to cool. When cold, cut them into small pieces and place them in a bowl. 2. Mix the garlic, tomato and pepper pastes, sumach, onion, parsley and salt together in another bowl and add the sesame paste that has been slightly thinned with a little water. 3. Add the mixture to the aubergine pieces and mix well. 4. Serve on a dish as an appetiser. Note: this shows the extent of the inventiveness of the frugal people of Marash. The aubergines have been used and only the peel remains? Don’t throw it away, dry and keep it! ‘The summer’s thorn is winter’s almond’ says the lady of the house overseeing its economy, and creates an appetiser from the aubergine’s green peel. It is eaten especially during fasting periods. 1. Gently heat the oil in a large frying pan until hot, add the hot water and some of the salt. 2. After the water has boiled, break the eggs into it so they remain whole. Cook them until they come to the surface. Sprinkle them with the ground pepper and rest of the salt. 3. Remove them from the pan and serve with rice pilav. Note: This is the Marash form of poached eggs, cooked in a mixture of oil and water. It is good to eat and healthful. They say that it is worth tasting. The people of Marash have another form of this dish: they like to eat eggs fried in plenty of oil, and instead of salt, they sprinkle them with sugar. 1. Remove and discard the green parts of the aubergines, cut into long strips of equal width and thickness. Remove and discard the middles of the peppers and cut them into large slices. Put them into a large saucepan of water and cook until they are slightly soft. Remove them from the water, drain then cover them with cold water. 2. Put the crushed garlic, mint, sumach, tomato paste, salt, vinegar and the cups of water into a dish and mix well. 3. Submerge the aubergines, chopped tomatoes and peppers into the mixture and mix again. Chill. 4. Serve chilled, drained, with lentil patties (vosbov köfte). Note: This appetiser is made on Good Friday, in memory of Christ being given vinegar to drink when He was on the cross. It is a firm custom to taste vinegar on that day. 3. Mix all the ingredients together, add the parsley and red pepper then knead well. Make the mixture into small balls. 4. Arrange on a dish and serve. Put the meat into a well-filled pan of water and heat it until it boils and remove the froth from the surface. Add the salt. After it is cooked, serve the broth in dishes, adding the pepper, with raw patties (hum kofte - çiğ köfte). Sometimes filled patties (michugov köfte) are cooked in the broth and served with it. Note: Gesdjor, in Marash dialect, means ‘half-water’ broth, in other words the broth from a half-cooked dish. 1. Soak the chickpeas in water overnight, drain and then cook in water until soft. 2. Evenly roast the wild pistachios, then pound them using a mortar and pestle, until they become like powder. 3. Mix the pounded wild pistachios with a little water and then squeeze it through fine gauze, retaining the liquid. 4. Cook the chickpeas in water until they are soft. 5. Pour the liquid over the cooked chickpeas then add the salt, stir and cook the mixture for a little longer, and then turn off the heat. Note: Menengiç is a kind of wild pistachio found in the forests surrounding Marash (Menengiç ağacı). Soup prepared using menengiç is the most-loved dish and eaten on a daily basis, generally for breakfast. It is usually dark in colour; the children call it ‘black soup’. 1. Soak the chickpeas and the de-husked wheat in water overnight, then drain. 3. Into a very large saucepan put the washed and drained lentils, chickpeas, de-husked wheat and whole onions and the salt. Add enough water and cook. 4. Chop and lightly fry some onion in oil. 5. When the lentils, chickpeas, de-husked wheat and whole onions soften, add the fried onion. 6. Cut the bread into small squares (croutons) and fry them until crisp. 7. Serve the hot soup immediately in soup dishes, adding the croutons, or cumin and red pepper instead. Note: Marash is rich with different kinds of lentils – black (green), red, whole or split, and both the rich, and especially the poor, eat lentil soup or yogurt and lentil mixture. Vegetables according to season – chopped Swiss chard, purslane or aubergines. 1. Soak the chickpeas and de-husked wheat in water overnight, then drain. 2. Wash and drain the lentils and vegetables. 3. Put the washed and drained lentils, chickpeas, de-husked wheat and salt into a very large saucepan. Add enough water and cook. 4. When the ingredients have softened in cooking, add the washed and drained vegetables – chopped Swiss chard, purslane or aubergines to the very large saucepan and continue to cook. 5. Heat some oil or butter in a small frying pan and add the crushed garlic and the tomato paste, stir, add the sumach and mint and immediately remove from the heat. 6. Add the fried mixture to the very large saucepan and let it boil twice, then turn the heat off and serve hot in soup dishes. Note: This is one of the best loved soups eaten in Marash, especially for its sweet-sour taste. It is prepared in all seasons – in summer with fresh and in winter with dried vegetables that are softened in hot water before use. 1. Wash and drain the lentils and cracked wheat and cook together in plenty of water. 2. Melt the oil in a frying pan, add the onion and fry, being careful to make sure it browns evenly. 3. When the lentils and cracked wheat are cooked, add the onion and oil and the salt and mix. Boil twice, turn off the heat and serve hot in soup dishes. It should be of a medium thickness. Note: This is one of the dishes uniquely cooked in Marash on a daily basis, in which lentils and cracked wheat are the main ingredients. Enjoy it! 1. Wash and drain the lentils and cracked wheat, put both into very large saucepan with enough water and cook them together until both are soft. 2. Wash the spinach with plenty of water, drain and chop. 3. After the lentils and cracked wheat are cooked, add the spinach and continue to cook for 10 minutes. 4. Turn off the heat. Thin the sesame paste with a little water and add it little by little to the saucepan, stirring it with a wooden spoon, to prevent the mixture from thickening. 5. Add the salt and pepper and serve hot in soup dishes. Note: This is a dish eaten almost every day. The preparation is enriched with vegetables – creating a dish with a mixture of flavours that is an appetiser, while the addition of sesame oil makes it even tastier and more filling. Tarkhana is a dish made of dried curds mixed with pounded wheat and yoghurt, from which a very tasty soup is made. To 1kg (2.2lb) pounded wheat use 4kg (8.8lb) drained yogurt. 1. Soak de-husked wheat in water overnight, then drain. It should then be cooked well in water, drained completely and left to cool. 2. Knead the cooked de-husked wheat like flour. 3. The yogurt and salt are added, and the mixture is kneaded very well, such that it becomes a single mass. 4. The whole is put into a clean, white cloth bag and hung up so that any remaining water drains away. This takes about 3-4 hours. 5. Lay out a white sheet in the sun and, taking a small piece of the dry mixture, knead it into a round patty with both hands and place it on the sheet. Continue this until all the mixture has been used. Leave them to dry thoroughly on the sheet in the hot sun. 6. Collect them up after they are dry and, putting them into a bag, hang it up in a dry place for use in winter. 1. Take 2-3 handfuls of dry tarkhana, wash and drain it and put it in a very large saucepan with water to boil. When it has boiled, throw away the water. 2. Refill the saucepan with enough hot water to cover the tarkhana, put it on a low heat to boil slowly, until it thickens well. 3. Beat contents of the saucepan well with a large wooden spoon, add more water and boil it several times, then turn off the heat. 4. Melt some oil in a pan and add the mint to it. Add this to the soup. Serve hot in individual dishes. Note: Marash’s tarkhana is nothing less than the chortan (dried yogurt and water curds) that is prepared in almost all Armenian-inhabited areas. Preparing tarkhana is laborious and very hard work, but the people of Marash do so with enthusiasm and pleasure. First they begin by cleaning and inspecting the wheat, and soaking it overnight. Early the next morning the wheat is drained, the fire is lit and the wheat is cooked in very large saucepans, until the grains swell. Then the water is drained off and the cooked wheat left to cool. After it has completely cooled, the work of kneading begins. Previously drained yogurt is mixed with the cooked wheat and the mixture is well kneaded, until it becomes one smooth mass. It is then put into bags and hung in a high place so that any remaining water drains away. Early the next morning the work of laying out small amounts made into patties begins. This requires skill and, because it is so labour intensive, all the neighbouring women and female relations come to assist, turning the work into a ceremony. By the time the broiling sun has risen the tarkhana has been laid out on white sheets on the flat roof. The spread sheets of tarkhana patties remind one of lacework and are spread out like long ribbons, without any indication of where they start or finish. The hard work has now ended. Now portions of the tarkhana are used as entertainment – sent to all the neighbours as samples to taste. The fresh tarkhana is put into small dishes, decorated with walnuts and taken to all the neighbouring houses by the children. This is an ancient tradition. After the mass of the tarkhana patties has dried in the hot sun for 2-3 days, it is collected up and put into specially sewn white bags and stored in the larder. Tarkhana is prepared in great quantities – enough to last all winter, according to the number of people living in the house, using 10-50 okas (12.5-64kg, 28-140lbs) of pounded wheat. 1. Peel the marrow and dice it after removing the seeds and peel. 2. Cook the meat and chickpeas in a very large saucepan filled with water, removing the froth. 3. After it is half-cooked, add the tomato and pepper pastes, lemon juice, salt and sumach. 4. Add the diced marrow, cover the saucepan and simmer until the marrow is soft. Put cooked mixture into a large, deep dish. 5. Heat the oil or butter in a small pan, add the dried mint and immediately pour it over the marrow mixture. Serve hot. 1. Wash and drain the pounded wheat, then put it in a very large saucepan with sufficient water, add the salt and cook it like pilav. 2. Melt the oil or butter in a pan. 3. When the water has been absorbed and the pounded wheat has become soft, add the melted oil or butter to the wheat and mix. 4. Fry small pieces of bread in oil or butter in a pan to make croutons, add to the wheat pilav and serve hot in a large dish alongside the hot marrow dish. Note: This is the Marash Armenians’ famous keshgeg ghabakhli that, as a unique Marash dish, is entitled to be called by the town’s name and achieve fame as Marash’s best dish. In reality the dish prepared in Marash reminds one very much of the famous Armenian dish ghapama. According to a tradition among Armenians, it is supposed to inspire love and joy, and for that reason, in many Armenian provinces, the groom’s mother prepares ghapama – cooked with marrow, oil and honey - on the day after the wedding for the bride and groom, their relatives, godfather and godmother, as well as all the rest of the guests. 1. Clean the whole onions and put them in a little water. 2. Gently heat the oil or butter in a large frying pan, add the diced meat and, turning frequently, fry until the colour of the meat changes. 3. Add the water, salt, tomato paste, pepper, tomato sauce and allspice and cook over a low heat until the meat is tender. 4. Coat the onions in oil and add them to the pan, and continue cooking until they are tender. Add boiling water if necessary to ensure that there is plenty of gravy. 5. Serve hot in a large dish with a pilav made of rice or cracked wheat, or occasionally with one made with lentils and cracked wheat (mudjaddere). Note: this dish made with onions is often served in Armenian houses in Marash accompanied by pilav. It is also prepared without meat, using olive oil and plain water, especially during fast days, with the appropriate ingredients, in a thickened form. 1. Heat the oil or olive oil in a very large saucepan, add the meat and, stirring continuously, fry it until its colour changes. 2. Add the green beans and garlic, continuing to stir and fry it until the colour of the beans changes slightly. 3. Add the salt, pepper, tomato and pepper paste and enough water to cover the saucepan contents. Cover the pan and, after it boils, lower the heat and simmer until the meat and beans have cooked and the sauce thickens slightly. 4. Serve hot on a large dish alongside cracked wheat pilav or raw patties (çiğ köfte). Note: unlike other Armenian regions, green beans are widely used in Marash in the preparation of many different dishes. This recipe is one that is highly regarded by the people of Marash, a really delicious dish. It is also prepared without meat but using olive oil during periods of fasting. 1. Boil enough water in a large saucepan, then put the meat into it and cook. Remove the froth from the surface. 2. Add the chopped tomato, tomato juice and salt and simmer until the meat is tender. 3. Add the aubergine and continue to cook until it is soft. 4. This dish has neither too much gravy nor is it dry, and has a middling consistency. It is served hot on a large dish alongside either rice or cracked wheat pilav. Note: The aubergine has a special place in Marash cuisine, being used in many - and sometimes surprising – ways. This dish is cooked in summer with fresh, and in winter with dried, aubergines. It is also cooked with olive oil, without meat, during periods of fasting, and is much loved. This dolma is prepared with previously dried and cored aubergines and red peppers. 1. Take the previously dried and cored aubergines and peppers and put them in hot water for a few minutes, until softened, then drain. 2. Heat the olive oil in a large saucepan, add the onions and cook until the onions begin to soften. 3. Wash and drain the rice. 4. Add, in succession, the washed and drained rice, 1 cup water, the tomato and pepper paste, sumach, salt, coffee, sugar, walnuts, parsley and pomegranate syrup. Mix them all together and remove the pan from the heat. The water will have been already absorbed. Allow to cool enough so that it can be handled with bare hands. This forms the dolma filling. 5. Carefully fill the softened, hollowed out aubergines and red peppers with the cooled mixture without packing them tight, otherwise when cooked they will split. 6. Arrange them evenly in a large saucepan, place a plate, smaller than the size of the saucepan, upside down over them, add enough water to completely cover the contents and the plate and cook. 7. Reduce the heat after the pan has boiled, add the lemon juice and simmer. 8. After it has cooked, drain. Allow to cool. Arrange the cooked aubergines and peppers (dolmas) on a large dish. 9. Crush the garlic and mix it with the thinned sesame paste in a small dish. 10. Pour the mixture over all the dolmas. Serve cold. This is the most loved dish eaten during periods of fasting. Note: Dolma (stuffed aubergines and peppers) are prepared during fasting periods in many Armenian-populated regions outside Marash and is a much respected dish. Despite many similarities, each region’s version differs in its ingredients and taste characteristics. Marash’s dolma with olive oil and tahini differs in its bitter taste and its unique addition of sesame paste and garlic. It is generally eaten cold. 1-1½ kg (2.2-3 lb) aubergines (preferably the white or light-coloured variety) cut into long strips, with the width and thickness being the same. 1. Heat the oil in a large saucepan, add the meat and, turning continuously, fry until the meat’s colour changes. 2. Add the salt, pepper and garlic cloves, and fry for a few more minutes. 3. Add the tomatoes and plenty of hot water and leave to boil. 4. Add the lemon juice, cover the pan and cook over a medium heat until the meat is tender. 5. Add the aubergines and continue to boil until they are cooked. 6. Add salt and pepper to taste. If necessary add hot water, to ensure that the dish has plenty of gravy. 7. Serve in a large dish with cracked wheat or rice pilav. Note: This dish is one that is much loved by the people of Marash, served on Sundays, and is considered worthy of serving when there are guests. It sits proudly in the centre of the table, with the pilav or tray patties next to it. Enjoy it! 1. Heat the olive oil in a large saucepan and add the chopped onion, garlic and meat. Fry until the meat changes colour. 2. Add the tomatoes and pepper paste, salt, pepper and enough water to cover the meat. 3. After the mixture has boiled, add the lemon juice and cover. Cook until the meat is tender. 4. Add the okra, cover the pan and simmer over a low heat. Continue cooking until the okra is cooked and the mixture thickens slightly. 5. Serve hot on a large dish, with rice pilav. Note. This is the Marash housewife’s masterpiece. The okra (bamya) is harvested when the heads have only just appeared. The tails are cut to a sharp point so that their juices are not lost. The dish is prepared in summer with fresh okra. In winter dried ones are used. The latter are put into hot water for a few minutes to soften them, then drained before use. The dish is served always accompanied by rice pilav and sometimes with raw patties (çiğ köfte). This dish’s bitterness must be evident. 1. Mix the meat with the tomato and pepper paste tomatoes, onion, green pepper, salt and black pepper. 2. Wash the marrows, remove the stalk ends, cut in half lengthwise, then into fine slices, also lengthwise. 3. Fill the bottom of a large saucepan with a layer of the sliced marrow, and then add a layer of the meat mixture (the filling). Continue to fill the pan, layer by layer, alternating marrow and meat mixture. While doing so, add the plums in various places. Add 3-4 cups water and cook on a low heat until the marrows soften and thicken significantly. 4. When cooked, empty into a large flat pan and put it into the oven to brown slightly. 5. Serve hot, without removing it from the pan, with cold tan (yogurt and water mixture) or yogurt. Note: All the different kinds of marrow – both summer and winter – are widely used in the Marash kitchen. This is a delicious dish using small, summer green marrows. This dish is put on to large copper trays and placed in the oven to brown. It is very tasty! 1. Put the bulghur into a wide and deep tray, sprinkle it well with water and leave it to soak for some time. 2. Add the salt and pepper and knead it a little. Add the meat, continually kneading and sprinkling the mixture and hands with the cold water until the mixture is soft and has become one mass. 3. Take a small amount (about the size of a walnut), squeeze it in the hand, and make it into a patty. Repeat for the whole mixture. Arrange the finished patties on a large plate and sprinkle with the chopped onion and parsley. Serve uncooked. Note: The meat for this uncooked köfte (patties) has to be red and very finely ground from carefully selected meat. In Marash it is usually beaten on a thick piece of wood until it is almost a paste. It is an irreplaceable dish for the Saturday evening meal or Sunday lunch. 1. As for çiğ köfte (above), but rolled into finger-like lengths. 2. Heat some broth in a large saucepan, add the prepared patties, and cook for a few minutes, until the patties rise to the surface. 3. Serve hot in a dish with the broth, sprinkling it with a little salt and pepper. Note: takhalokh is also a delicious dish from Marash, usually made from what is left of the çiğ köfte mixture. 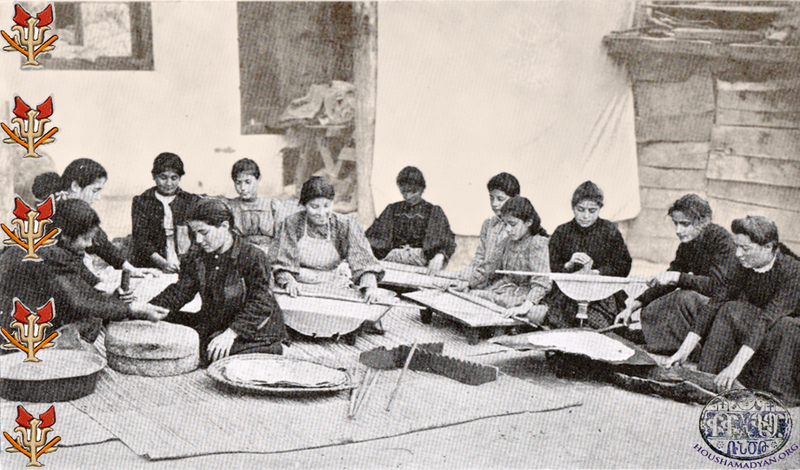 The women of Marash say ‘what is left over from Sunday satisfies Monday’s appetite’ and, before the çiğ köfte mixture dries, make the meal for the following day. 1. Season the ground meat with the black and red pepper, add the salt and allspice, mix well and make into balls about 1½-2 cm (5/8-3/4 inch) diameter. 2. Heat oil in a frying pan, and then carefully add the meat balls. Turn them carefully while frying to ensure they are evenly fried all over. 3. Heat some oil in a saucepan and add the onion and fry until the onion softens. Add the tomato and pepper paste, mix and add water, and then add the garlic, salt and pepper, lemon juice and dried mint (if required). 4. Add the meat balls after the pan has boiled. Boil the pan again two or three times (5-7 minutes is sufficient), then turn off the heat. 5. Serve hot in a large dish with rice pilav. Note: The Marash cook is ingenious: her skills, expertise and feeling for flavours have also been transferred to the dishes served. It is worth trying! 1. Put the meat for the filling into a frying pan and, stirring continuously, fry until all the fat has melted and the meat has changed colour. 2. Add the oil, stir and add the onions. Fry until the onions become soft. 3. Add the spices, stir and then turn off the heat. Put to one side and allow go completely cold. 1. Put the cracked wheat into a wide and deep tray, sprinkle it well with water and leave it to soak for some time. 2. Add the salt and pepper and knead it a little. Add the onion quarters, continually kneading and sprinkling the mixture and hands with water until the mixture is soft and has become one mass. Remove the onion quarters and discard them. 3. Divide the mixture into egg-sized pieces. 4. Frequently wetting the fingers, take one of the pieces in one hand and make a hole in it with a finger. Increase the size of the hole with the finger (thus thinning the walls of the piece) such that it is like a hollow ball. 1. Fill the hollow cases with the cold filling previously prepared and then close the ball up by bringing the edges of the hole together. Put the finished patties into a tray. 2. Heat broth or water in a large saucepan. Add 1 teaspoon of salt. After it has boiled, add the patties (köftes) and simmer for about 5 minutes, until they come to the surface. 3. Remove the patties with a large straining spoon and serve hot. Note: The people of Marash prepare these patties shaped like balls and boiled, rather than egg-shaped and fried as in other places. They are quite often cooked in ges djor (half water) soup and served in it. 1. Heat the oil in a frying pan, add the chopped onion and fry until the onion turns a golden colour. Add a little water and the tomato paste, salt and boil. When boiled turn off the heat and leave to cool. 2. Put the finely ground cracked wheat into a large tray and sprinkle with the cooled onion and tomato mixture and, using cold water to wet the hands, knead the ingredients well until they become a soft, single mass. 3. Take a small amount, squeeze it in the hand, and make it into a patty about the size and shape of a walnut. Repeat for the whole mixture. Arrange the finished patties on a large plate and sprinkle with the parsley. Serve uncooked. 1. Put the finely ground cracked wheat into a large tray and sprinkle with a little of the cold water. Add a teaspoon of red pepper. Wetting hands with the cold water, lightly knead the ingredients. Add the finely ground meat and knead well into a single mass. Roll all the mixture into balls the size of chickpeas. 2. Put the meat on the bone into a large saucepan of water and boil, removing the froth. Add the tomato and pepper pastes, the chickpeas and the coarsely chopped onion. Boil until the meat and the chickpeas soften. 3. When the meat and chickpeas have cooked, add the prepared meatballs and cook until they rise to the surface. 4. Melt the butter or oil in a frying pan then add the crushed garlic, dried mint and allspice. Add this to the large saucepan of köftes and boil twice. Then turn off the heat. 5. Put the contents of the saucepan, except for the bones, into a soup serving dish and serve hot. Note: This is a marvellous Marash dish with great aroma and flavour. The people of Marash say that it is ‘worthy of guests and loved one alike’. A rich dish, rich in flavour – don’t be shy of adding plenty of allspice! 1. Wash and drain the chickpeas and cracked wheat, put them into a saucepan of water and cook until soft. 2. Heat the oil in a frying pan. Tear the lavash bread into small pieces and put into the oil. Fry until lightly browned. 3. When the pilav is cooked, put it onto a large tray and cover with the oil and fried bread. Serve hot on a large dish immediately. 1. Cook the chicken in water. When cooked, drain, retaining the water (broth). Cut the chicken into pieces. 2. Heat oil in a frying pan and fry the chicken pieces lightly. 3. Heat a little oil in another small frying pan and fry the walnuts. 4. Wash and drain rice. Put it in a saucepan and add the broth from cooking the chicken and cook. 5. Make the dough with the flour, olive oil and water, kneading it well. Roll it out thinly using a rolling pin and spread it in the bottom of a reasonably sized oven roasting dish. 6. Add the allspice, cinnamon, walnuts and chicken to the rice and mix well. 7. Put the mixed rice in the centre of the dough Bring the edges of the dough together and seal them in the centre, enclosing the mixture like a parcel. Carefully turn the dough parcel over in the dish, ensuring that it does not break open anywhere. 8. Beat the egg and brush it all over the dough. Place the completed dish in the oven and cook for 15-20 minutes, until it turns pink. Serve hot on its tray. Note: This is a delicious pilav eaten on festive days. After returning from the Easter church service, the fast is ended with chicken soup then this dish of meat and pilav is eaten with relish. 1. Peel the marrow, remove the seeds and clean the centre, dice to small size. 2. Put the meat, diced marrow, the peeled and diced tomato and chopped green pepper into a large saucepan. 3. Add the tomato and pepper pastes, mint, salt and rice and mix. 4. Add enough water to cover the saucepan contents then cover and cook on a low heat until the water is absorbed, and the marrow and rice have cooked and softened. 5. Serve hot on a large dish with sour cream, yogurt or tan (yogurt and water mixture). 1. Wash and drain the rice and put it into a large saucepan. Add the 3 cups of water and salt and cover the pan. Cook over medium heat until the water is absorbed and the rice is half cooked. 2. Melt some butter or oil in a frying pan, add the chopped onion and fry until it is soft. Add the finely ground lung and stir very well. Continue cooking until the colour of the lung changes and it is fried. 3. Melt some butter or oil in another frying pan and brown the coriander, almonds and pistachios (each ingredient separately), without allowing them to burn. 4. When the rice has absorbed the water and it is half cooked, add the sweet pepper and cinnamon and stir. Then add the fried coriander, almonds and pistachios and the fried lung and, after mixing well, turn off the heat and, covering the pan with a cloth and its lid on top, leave for 10 minutes. 5. Serve hot on a large dish. Note: This is a wonderful Marash pilav. In accordance with custom when, on a feast day or special occasion a lamb is slaughtered, this pilav is cooked without fail, putting pieces of cooked meat on the top – a real festive dish. 1. Clean and drain the de-husked wheat, chickpeas and beans. 2. Put them all in a saucepan and cook them until tender. 3. Put into a dish and pour the syrup over it. Serve hot. Note: Sweet soup is made in various ways everywhere. Marash’s sweet soup is different due to the vegetables used and the use of syrup instead of sugar. It is the ornament of the New Year’s Night table. 1. Make dough using the flour and water and roll it out, using a rolling pin, to a medium thickness. 2. Cut into large strips and bake on a metal sheet dome (sadj) over the fire. 3. Brush clarified butter and sprinkle sugar on each strip while they are still very hot and roll each up immediately. 1. Dissolve the starch in a pan with 2 cups of water, so that it becomes a smooth paste, then pass it through a fine sieve into a saucepan. 2. Gradually add the remaining water and the grape syrup and stir well. 3. Put the saucepan on to a low heat and stir continuously, until the mixture thickens and becomes sticky. 4. Melt the oil in a frying pan, add the cut bread and fry until golden brown. Remove them from the pan and put aside. 5. Using the same oil, sear the walnuts, pistachios and ground cinnamon. 6. Serve warm in individual dishes, sprinkling the fried bread, walnuts, pistachios and ground cinnamon over each. Note: This is the famous Marash hapesa, usually taken by women as a sweet to a female relative who has just given birth. 1. Wash and drain the dried, chopped apricot then put it in a saucepan of tepid water for 2-3 hours, until it is slightly soft. Put the pan on the heat, adding the washed and drained raisins. After boiling it 2-3 times, remove from heat and cool. 2. After it has cooled add the syrup and serve cold. 1. Grind the bread finely. 2. Melt the oil in a frying pan, add the water and sugar and, after it has boiled, add the ground bread. Boil the mixture for a few minutes, until the bread is soft. 3. Fill appropriate dishes and serve. 1. Clean and drain the cracked wheat and put into a tray. 2. Mix, in a separate tray, the oil and syrup with the water until it becomes a whole homogeneous and equal mass. 3. Empty this mass onto the cracked wheat and mix. After it has absorbed the mixture a little, knead into a sort of dough. 4. Form it into small patties (squeezing them like çiğ köfte) and arrange them on a dish. Serve. 1. Boil the cheese in water in a large saucepan until it begins to melt then drain. 2. Put the flour into a very large frying pan over low heat and, mixing continually, cook it evenly until it all turns a nice golden colour. Care must be taken to ensure one side is not burnt and the other remains uncooked. 3. Heat the oil in another pan until it bubbles, and then add the sugar. 4. Gradually add the oil and sugar mixture and the browned flour to the cheese. 5. Mix the whole mixture well until it is one homogeneous mass, then spread it out in a tray and serve hot. It is eaten hot. 1. Put the wheat and the chickpeas into a saucepan with 6-7 cups of water and boil over medium heat until soft. 2. When cooked, drain and put the wheat and chickpeas onto a tray. 3. Sprinkle the sugar, cinnamon, walnuts, pistachios and almonds over it.